These pages should enable you to better comprehend the software, in order for you to accomplish multiple effects in your own movies. The only limitation with the software will be your own creativity. The information below should be read, preferably, in the order presented. Even though the first four lessons may seem difficult, they are an essential base for you to build upon in order to grow your knowledge of HFX. To continue with these lessons, it is assumed that you have a good working knowledge of Studio. I cannot be held responsible for any errors that may occur while following these instructions. Please, always backup your computer before any modification. Regulary save your work. And now, enjoy the HFX tutorials. 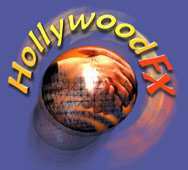 What is Hollywood FX ? Advanced keyframe editing (ability to edit flight paths and all space/time parameters). Includes advanced presets and allows the setup of all parameters. Advanced settings: every transition has its own parameters, you can change flight direction, trails and antialiasing very easily. You have the ability to store and re-call your warp path (envelope). Advanced morphing, adapting shape to the object. Full set of tools to create your own FX: modify one of the existing HFX or create a new one and use cloning (for objects or transitions), MultiWindow FX, and 3D composites. Ability to add 1 to 99 video timelines for multiscreen. Instant visualisation of your effect in real time. Ability to move the "camera" within the environment, or around an object. Media: in addition to transitions, Hollywood FX includes some 3D MultiWindow effects that can be mapped onto HFX objects. Transitions are organized into categories with icons that let you find the transition you want. You can even reorganize your own effects into categories. Plugin: Hollywood FX includes a set of image filters and 3D warp plugins; ripple, explode, peel or twist any 3D object. Use Chroma Key or Luma Key with any media. Surfaces: surfaces of 3D objects can be mapped with video or simple colours. Easily modify your basic color, luminosity color, and shine. Ability to import 3D objects, in hfo format (Lightwave). HFX Pro (include in Ultimate / Ultimate Collection) contains 384 HFX effects in twelve categories. The following movie has been created by "Mamounette" using Hollywood FX. It gives you an idea of what can be done using this special effect software.